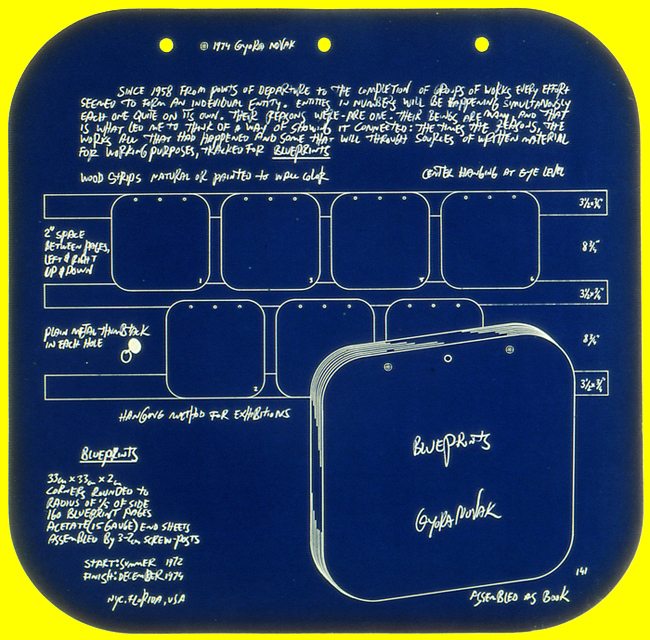 “Blueprints” as exhibit and symposium at the M.I.T. School of Design, was a unique event made possible by the book itself. Most artists function by adhering to a limited visual expression, creating easy identification by the viewer, a factor in which the art market functions. In Novak’s case, his ten or more art groups each year were mostly done in keeping with his mode of ideas expressed in a multitude of mediums, causing the viewer to perceive a lack of continuity . The “Blueprints” book was conceived as a tool to bridge over this perceived lack of continuity. Without the book, most people could not connect on their own, and recognize his philosophical “concept of oneness”, which unified his body of work. Nor could they realize what he called his “thumb print”, referring to his expressed sensibilities within his work. The 160 page book of 13 X 13 inch scale, was designed to open up and to be hung by thumb tacks as a graphic exhibit, providing by visual and by text, a pathway of continuity throughout Novak’s years of creativity. M.I.T. School of Design, at the time directed by Otto Pineh, organized the event in it’s auditorium as venue for both the display and discussions . Faculties, students and graduate students of art, art history, design, and architecture were invited to participate in the event.